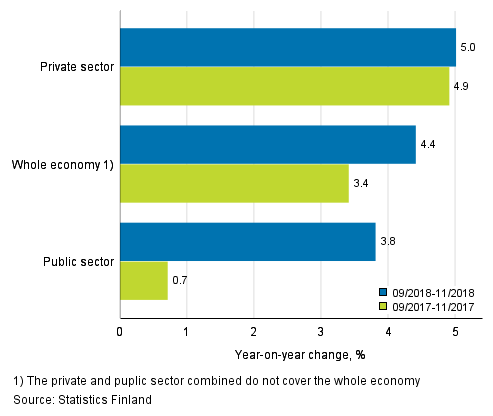 According to Statistics Finland’s data, the wages and salaries sum of the whole economy was 4.4 per cent greater in the September to November period than in the corresponding period twelve months earlier. In November, the wages and salaries sum of the whole economy grew by 6.3 per cent from the year before. One year previously in September to November, the wages and salaries sum of the whole economy increased by 3.4 per cent. 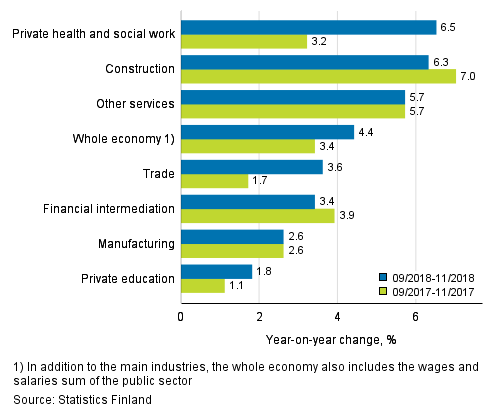 In September to November, the wages and salaries sum increased faster than the whole economy in the industries of private health and social work (6.5%), construction (6.3%) and other services (5.7%). The increase in the wages and salaries sum was most moderate in the industries of manufacturing (2.6%) and private education (1.8%). The wages and salaries sum in the private sector was 5.0 per cent greater in September to November than twelve months earlier. The wages and salaries sum of the public sector was 3.8 per cent higher than in the corresponding period one year previously. In November, the wages and salaries sum in the private sector increased by 7.8 per cent and in the public sector by 4.2 per cent from one year earlier. In September to November one year ago, the wages and salaries sum grew by 4.9 per cent in the private sector and by 0.7 per cent in the public sector from the previous year. Starting from 1 January 2019, all wage and salary income and earned income used in the wage and salary indices are reported to the Incomes Register. Therefore, data published in March 2019 concerning the wage and salary indices concerning January 2019 come from different data than before due to the change. The data previously derived from the Tax Administration's data on self-assessed taxes. Read more about the change: Changes in these statistics. Starting from this statistical release the latest industries defined by the Business Register have been taken into use in the turnover and wage and salary indices. The industry corrections are visible as revised data in some of the published industries for the years 2017-2018. The effects of the changes are taken into consideration in statistics production so that no breaks occur in the time series of the published index series. The interpretation of the statistics also remains unchanged in the renewal. Revisions to annual changes in industries are presented under Revisions in these statistics. ISSN=1798-6125. November 2018. Helsinki: Statistics Finland [referred: 21.4.2019].